Camp T-Shirt Day is Right Around the Corner! 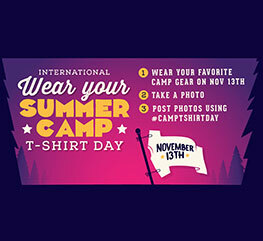 We invite all Gold Arrow families to join us and other camps and camp families around the world as we celebrate International Wear Your Summer Camp T-Shirt Day on November 13th. Do you want to take part in the fun? It’s easy, just wear your favorite GAC shirt, take a picture, upload it to social media, and use the hashtag #CampTshirtDay. If you tag us too (@goldarrowcamp), we’ll share some of our favorites on our Instagram. We can’t wait to see your best GAC gear!